On 28 October 2017 the second annual Puhinui Stream Challenge Fun Walk takes place (see details here). The six-kilometre walk begins in Hayman Park, near Manukau City Centre, and ends in Totara Park. In some stretches the route follows the course of the upper Puhinui Stream. It offers a chance not only to get to know this beautiful but little-known waterway but also to observe the results of change in an area which as little as 60 years ago was almost entirely rural. Ref: Puhinui Stream Challenge Route Map, Auckland Council, 2017. A minor change to the route has been made just beyond the 4 km mark. The motorway underpass has been temporarily closed, so the route now follows the Orams Road bridge instead. In 1966 the newly formed Manukau City Council bought a 364-acre (147.3 ha) tract of farmland at Wiri to build a new city centre. The first commercial building (a hotel) went up in 1974. 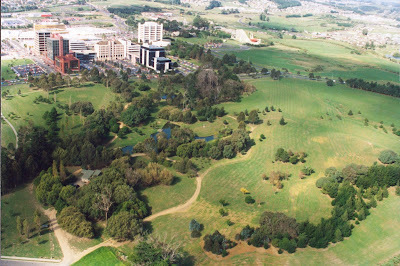 The same year, development of a 20-hectare park to the west of the planned city centre began. This was named Hayman Park to honour Mike Hayman, the council’s first City Planner. Ref: Eileen Reyland. Aerial photograph of Hayman Park and Manukau City Centre, ca 1994. The tall white building at upper centre is the Manukau City Council administration building, now the Manukau Civic Centre. Across the fields to the right is the Rainbow’s End roller coaster. Part of the Puhinui Stream can be seen on the extreme upper right. Ref: Whites Aviation. 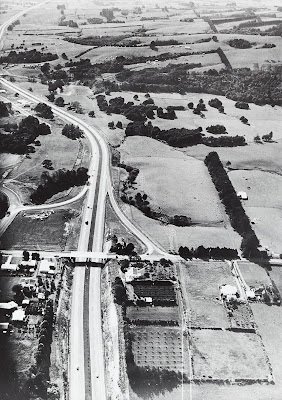 Aerial view of Wiri, 1949. White’s Aviation no. 20628 / Auckland Libraries Footprints 05949. This shot covers much of the same area as the 1994 photograph above. Wiri Station Road is the road that crosses the middle foreground. The original farm landscape was altered by the excavation of ponds along the course of a minor tributary of the Puhinui and the development of a small hill on the park’s south-western corner. However, existing stands of pine, macrocarpa and eucalyptus trees were preserved. In 1974 more pines and eucalyptus trees were planted, as well as poplar, willow, silver birch, spruce and cypress. Later planting included some natives such as puriri, kauri and kōwhai but mostly exotic species, including redwoods, liquid ambers and magnolias. The striking building that now sits on the south-eastern corner of the park houses the Manukau Institute of Technology’s Manukau campus and the Manukau railway station. Designed by Warren & Mahoney Architects, its six stories wrap around a covered central atrium. The railway station was opened on 4 April 2013, the campus on 20 June 2014. On the opposite side of the road, the new Manukau bus interchange is under construction. This is due to open in the second quarter of 2018. While waiting at the intersection beyond the MIT building, you can observe several other significant buildings further along Manukau Station Road. The Manukau civic building was opened by Manukau City Council on 19 February 1977. For many years it was popularly known as the ‘White House’. The Manukau District Court, the building faced with orange bricks opposite, was first opened on 15 December 2000. The Manukau central police station was built in stages between 2007 and 2011. Wiri Station Road curves gently downhill above the South Eastern Motorway, the final stretch of which was completed in 2010. 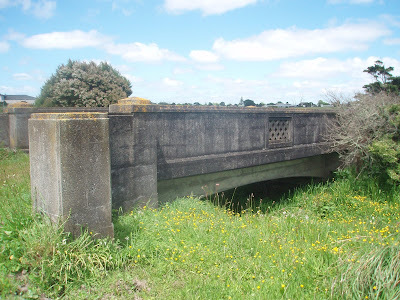 The Puhinui Stream passes under the next intersection via culverts (not accessible for safety reasons). It then emerges behind the Mitre 10 building on Lambie Drive and twines through the Wiri industrial area for several kilometres, before passing McLaughlin’s Mountain (Matukutūreia) and joining the Manukau Harbour as a tidal creek below the Puhinui Reserve. This trail, however, goes upstream. For a kilometre or more the route now runs along the Wiri Stream Reserve, aka Puhinui Stream Reserve. The housing development here, originally known as Wiri Park West, was begun by the Ministry of Works in 1975. It was referred to as ‘high-density housing’ at the time. The stormwater ponds along the stream, which were installed when the reserve was first developed, were redeveloped in 2001. The fale-like roofline of the Manukau Events Centre can be seen to the east from some sections of the reserve. Originally known as the Pacific Events Centre, this was opened in April 2005. Ref: Bruce Ringer. ‘The bridge to nowhere’, 2009. Auckland Libraries Footprints 06125. In the further distance are the buildings of the Manukau SuperClinic, the first stage of which was opened in 1997. As Kerrs Road approaches Great South Road, newly built terrace housing to the right marks the site of the old Woodside School and headmaster’s house. During the 19th century the settlement here was known as ‘Woodside’. By the 1920s the name ‘Wiri’ had come into general usage instead. The Woodside School building was moved to Manurewa in 1906; the headmaster’s house remained in place until it was demolished in 2013. In 1984 Manukau City Council formally resolved to adopt the name ‘Manukau Central’ in place of ‘Wiri’. It may have been about this time that the Wiri Stream became more generally known as the Puhinui Stream. From 1982 to 2004 the ‘homestay’ building on the corner of Kerrs Road and the Great South Road was the NZ Fire Service’s Auckland Division Southern Command headquarters. Across the road, Changda International’s ‘Pacific Gardens’ housing development is underway. It is planned to build 1100 houses and apartments on the 9.4 ha site. A few paces southward down Great South Road is St David’s Anglican Church, a rare surviving reminder of the area’s rural past. St David’s was opened on 29 August 1880 (the apse was added in 1887 and the vestry in 1901). The cemetery behind the church is the oldest official burial site in the district. Some way further down the Great South Road, the walk rejoins the stream via the Puhinui Bridge pedestrian underpass. For about a kilometre the route then continues along the Rata Vine Stream Reserve, before crossing over the motorway via the Orams Road bridge. The name ‘Rata Vine’ probably refers to the sometime presence of climbing rātā (akatawhiwhi) in the bush lining the stream further to the east. Ref: Bridge across the Puhinui Stream at the end of Orams Road, Manurewa, 1939. Courtesy Manurewa Historical Society / Auckland Libraries Footprints 02966. This modest, one-way wooden bridge gave access to the Peguero and Horsfall farms. 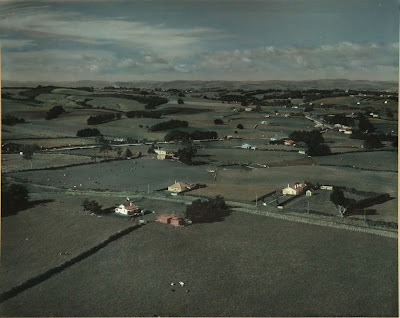 Ref: View looking east from Orams Road, Manurewa, ca 1940. Courtesy of Raymond Peguero / Auckland Libraries Footprints 01266. The southern motorway now runs across the low ground below the hills. The Puhinui Stream is immediately to the right of the photograph. Although there is evidence of intensive pre-European Māori settlement along the banks of the lower Puhinui Stream, near the Manukau Harbour, few archaeological remains have been found along its upper stretches. However, the stream itself and its surrounding bush tracts were doubtless a rich source of foodstuffs. In an interview in 1973, long-time Manurewa resident Raymond Butterworth recalled that well into the early 20th century, a group of Māori (the iwi has not been recorded) used to regularly camp on his family’s farm alongside the stream at the end of Orams Road, combing the bush for flax and kiekie and catching eels in the stream. Ref: Trevor Penman. 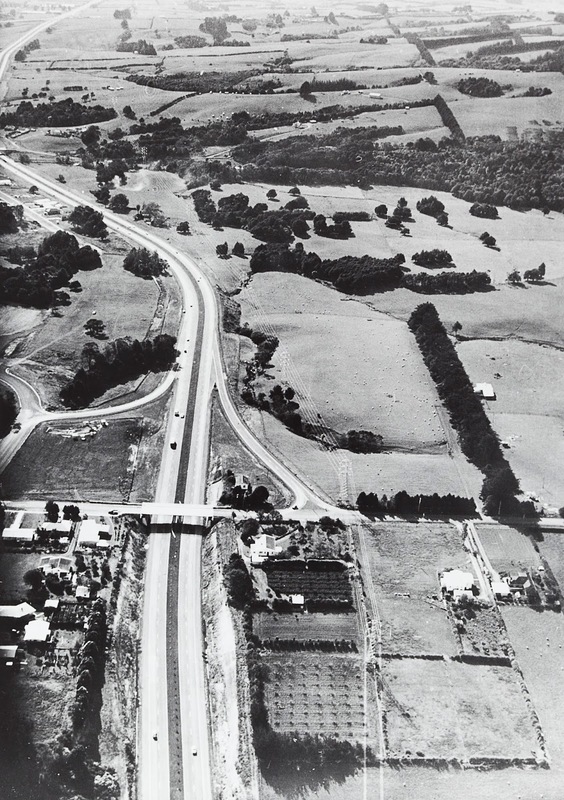 View of the Southern Motorway, Manurewa, ca 1964. Courtesy of Mrs Gladys Penman / Auckland Libraries Footprints 02995. The Hill Road bridge is in the foreground. The Auckland Botanic Gardens have since been developed in the fields to the right of the motorway. The watercourses that twine through these fields drain into the Puhinui Stream, which itself is hidden in the bush towards the top of the photograph. The footpath across the Orams Road bridge leads into the Auckland Botanic Gardens. The gardens were developed by the Auckland Regional Council on land purchased from the Nathan family in 1968. They were formally opened to the public on 23 February 1982. The walk keeps within the grassed areas of the park, although several pedestrian bridges to the left give access to the bush sections of the Puhinui Stream Forest Trail. The bush which can be seen here was mostly milled or cut over during the 19th century, although in some steeper parts older trees survived. 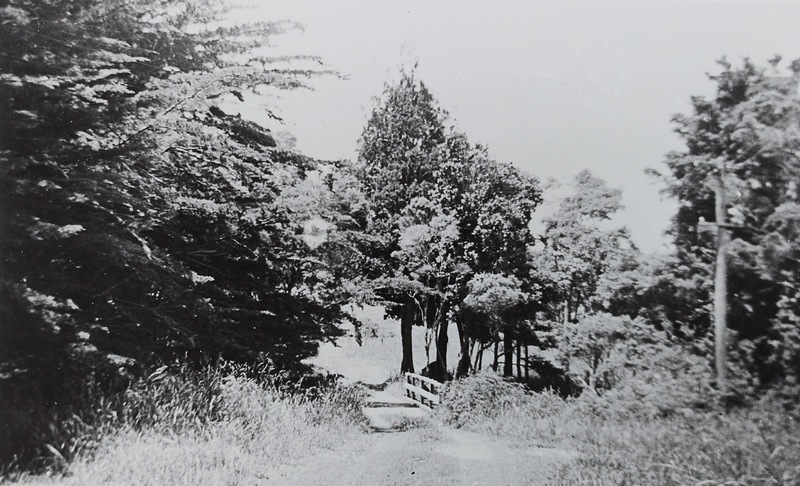 Local landowners also often preserved notable stands of totara and other native trees on their properties. The pond seen to the right was developed when the Botanic Gardens first hosted the Ellerslie Flower Show in 1998. 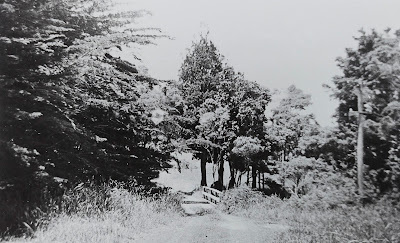 Not long before the path passes from the Botanic Gardens into Totara Park, it passes below the site of one of several United States military camps that were established in Manurewa in 1942 (there are no visual remains). Here, the walk also passes close to the banks of the stream (take care!) In past years the Puhinui Stream was notable for the purity of its water. After major extensions to The Gardens subdivision during the late 1990s, problems arose with runoff, erosion and sedimentation. Extensive remedial work was needed, including the construction of several large stormwater ponds alongside the stream further to the east. In 1966 Manukau City Council agreed to buy the 354-acre (143.4 ha) Totara Park estate from well-known businessman Charles Prevost. The homestead block of the estate was opened to the public in June 1968. Further purchases of land followed until by 2007 Totara Park totalled 220 hectares of bush and farmland. The walk ends in the ‘Scouts field’, part of the original purchase. This was formerly the site of Totara Park Youth Camp, established by a consortium of youth and service groups in the estate’s old stable buildings in 1969. After many years of service, the camp was closed in 2001, and the buildings were demolished in May 2003. 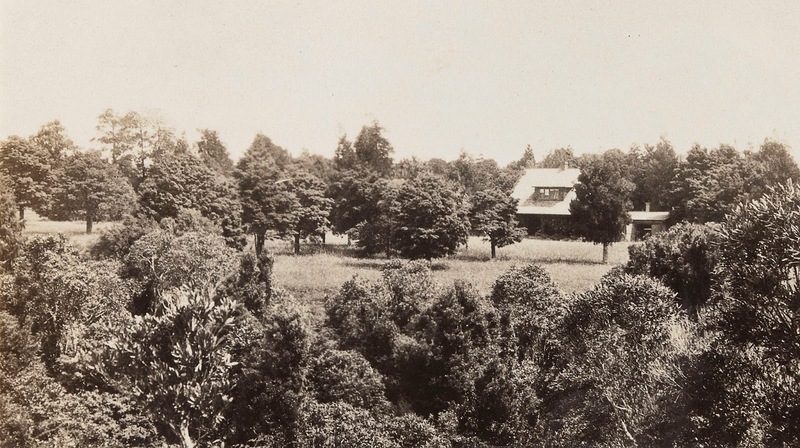 Not far way is the Totara Park homestead, formerly known as Totara Lodge, today known as Beaufords. The older, tile-roofed part of the house was built for Mr Arthur Gillies in 1925. The two-storey modernist section was added by Sir James and Lady Jessie Gunson in 1932. 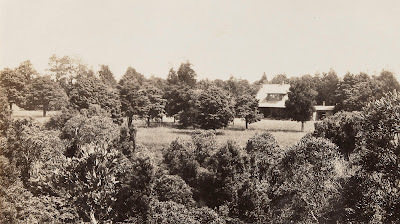 Ref: View of the original portion of the Totara Park homestead, Manurewa, 1929. Courtesy of Jonathan Gunson / AucklandLibraries Footprints 03190. The bush in the foreground lines the Puhinui Stream. The main swimming pool, tennis court, tennis pavilion and other ancillary buildings formed part of the purchase. In 1969 Manukau City Council leased Totara Lodge out as a reception centre. This was initially known as the Totara Park Reception Lounge. The name ‘Beaufords’ was coined when two later lessees, Graham Beaumont and Dennis Mockford, combined their surnames. Totara Park stretches as far as Redoubt Road to the north and Mill Road to the east. The Puhinui Stream’s main source lies in the hills on the far side of Mill Road. A secondary source originates within the park itself, in the valley below Redoubt Road. For further reading, see Countryside in the City: A History of Totara Park (Auckland Communities Foundation, 2012) and Gwen Wichman, Soaring Bird: A history of Manurewa to 1965 (Manurewa Historical Society, 2001). More information and photographs can be found on the Auckland Libraries databases Manukau’s Journey and Footprints. 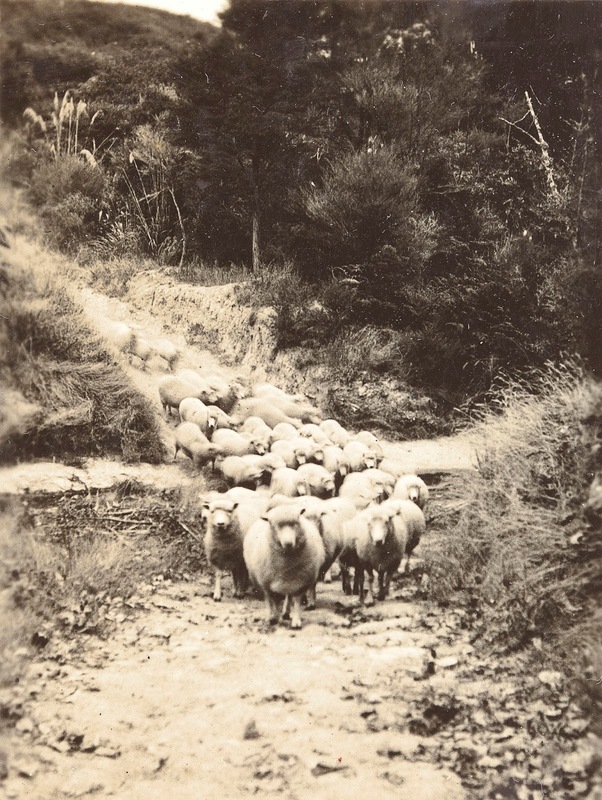 Ref: Lady Jessie Gunson, A flock of sheep crossing the Puhinui Stream, 1935. Courtesy of Jonathan Gunson / Auckland Libraries Footprints 03198.